The Israeli-American Coalition for Action. We are a non-profit, non-partisan organization dedicated to strengthening the US-Israel relationship and making the voices of Israeli-Americans heard by policymakers on a range of issues at the federal, state, and local level. We connect advocates to action. Let’s get started. AICC-CAR seeks to further business relationships between companies in the Greater Philadelphia Region and Israel. Serves locations throughout Pennsylvania and even in bordering states. September 2009: Gov. David Patterson signed an MOU with Israel's Industry, Trade and Labor Minister Binyamin Ben-Eliezer on industrial R&D cooperation in the areas of nanotechnology, biotechnology, and public and internal security. 1989: Gov. Mario Cuomo created the International Partnership Program to promote exchanges with Israel in culture, tourism and economic development. The Israeli Business Forum of New York (IBF) is an apolitical, nonprofit organization established in October 2002. IBF's mission is to facilitate quality business discussions among Israeli professionals in New York. Through our programs we enable a group of professional Israelis to interact on a regular basis and exchange ideas about Israeli related issues. The IBF encourages meaningful discussions and business interactions among our members in order to promote their contribution to Israeli society and economy. The AICCI is devoted to bringing US and Israeli businesses together while advocating for policies that encourage investment, increase the flow of trade, investment and transfer of technology between Israel and the US. Originally established in 1973, the AIEC has changed its official name numerous times over the course of three decades yet its mission remains the same. In general it is a support group for Israel whose activities include education, town planning, lobbying for legislation to protect and enhance the environment, preservation of historical sites, the improvement and beautification of industrial and commercial areas and sponsoring the CBI Center for Environmental Studies located in Yarkon Park in Tel Aviv. In 2017, Indiana exported over $113,000,000 worth of goods to Israel. 9 different Indiana universities or research facilities receive grants from U.S.-Israel binational foundations. In 2014, Governor Mike Pence spent 9 days in Israel meeting with business leaders to promote trade and collaboration between Indiana and Israel. In 2016, the Indiana state legislature passed strong anti-BDS legislation that was signed by Governor Mike Pence. In 2012, Indiana passed strong Iran sanctions legislation prohibiting state agencies from investing in companies that invest in Iran. Wyoming exported over $2,000,000 worth of goods to Israel in 2017. The University of Wyoming has received research grants from U.S.-Israel binational foundations. The University of Wyoming has established three different study abroad programs with Israeli institutions. West Virginia exported $6,000,000 worth of goods to Israel in 2017. West Virginia University and West Virginia-based USDA Appalachian Fruit Research Center have both received research grants from U.S.-Israel binational foundations. When 300,000 West Virginia residents were left without clean drinking water after a chemical leak in 2014, Israeli water experts traveled to Israel to provide immediate solutions and help prevent future emergencies. The Vermont-Israel Agricultural Exchange was created in 1991 by then-Congressman Chuck Ross after participating on a trade mission to Israel. The program is run out of Vermont’s Department of Agriculture and is funded by the state. Arrow Tech Associates, located in South Burlington, has been the recipient of Foreign Military Financing contracts for Israel. 3 Vermont institutions receive grant money from U.S.-Israel binational foundations: National Forest Services, University of Vermont, and the U.S. Forestry Reserve. In 2005, Governor Howard Dean traveled to Israel with the National Jewish Democratic Council, sponsored in part by the American Jewish Committee’s Project Interchange. December 2010: University of Texas Southwestern Medical Center entered into a cooperative agreement with he Rabin Medical Center in Israel to collaborate on faculty and student exchange programs, as well as the development of joint studies, research and training activities, and other educational programs of mutual interest. 2002: MOU was signed to foster collaborative practical and applied research between agricultural scientists areas of high priority to both Texas and Israel. 1992: A Memorandum of Intent was signed between the two governments with a focus to broaden the Texas-Israel SemiArid Fund (see 1985), encourage greater participation and to prove, through applied research, that the similarities in agriculture between Texas and Israel can be a lesson for both partners. 1985: Texas-Israel Semi-Arid partnership was created after the signing of an MOU between the Texas Department of Agriculture and the Ministry of Agriculture of the State of Israel to work together on projects of mutual agricultural benefit to the peoples of Israel and Texas. In 2017, disabled Israeli veterans traveled to Newport, Rhode Island for a one-week educational and rehabilitation program through Sail to Prevail – the National Disabled Sailing Program. Researchers at Brown University receive significant funds through U.S.-Israel binational foundations. This year, in honor of Israel’s 70th Independence Day, the Rhode Island State House was lit up in blue honoring the relationship between Rhode Island and Israel. In 2017, the Rhode Island-Israel Collaboration for the Promotion of Commerce, Academics and Science was announced. North Dakota exported $2,000,000 worth of goods to Israel in 2017. The University of North Dakota Medical School has received research grants from U.S.-Israel binational foundations. In 2017, the Israeli oil and gas company Israel Opportunities purchased 10 oil fields in North Dakota. A drone built by Israeli company Elbit brought technology to North Dakota farmers to provide vital agricultural data. North Carolina exported $150,000,000 worth of goods to Israel in 2017. 8 different North Carolina universities or research facilities have received grants from U.S.-Israel binational foundations. Since 2005, Israeli companies have invested more than $590 million in North Carolina and have created more than 1,000 jobs. In 2017, North Carolina passed strong anti-BDS legislation that punishes companies involved in state business that are involved in the BDS movement. June 2008: Gov Bill Richardson signed an agreement of cooperation with Israeli Minister of Industry Eli Yishai that spells out a process to create strategic partnerships to cooperate on the advancement of joint water and energy technologies. The NMIBE was formed to raise local awareness about Israel's entrepreneurial and general business activities, and encourage mutual cooperation between New Mexico and Israel in the business world. The organization helps New Mexico companies do business with Israel in order to encourage a collaborative relationship between the two. NIMBE provides business development connections in Israel to New Mexican companies, and connects industry leaders in both states. New Jersey and Israel annually trade about $1.3 billion in goods. Dozens of New Jersey universities and research institutions have received grants from U.S.-Israel binational foundations. The New Jersey-Israel commission was established in 1988 to foster relationships between New Jersey and Israel regarding business development and international trade, education, culture, and tourism. In 1994, the New Jersey Department of Commerce and Economic Development opened a branch in Israel to promote business ties between New Jersey and Israel, particularly in the high-tech realm. In 2016, New Jersey passed a law prohibiting the state from investing pension and annuity funds in companies that participate in the BDS movement. New Hampshire has been an important recipient of Foreign Military Financing contracts for Israel. New Hampshire companies that have landed these contracts include L-3 Communications Corporation in Londonderry, Milpower Source in Belmont, and Sponge-Jet Inc. in Portsmouth. In 2014, New Hampshire Senator Kelly Ayotte led a mission with two of her senate colleagues. Both Dartmouth College and the University of New Hampshire receive grants from U.S.-Israel binational foundations to promote R&D and academic cooperation. NH4Israel is an organization, established in 2006, working “to educate the New Hampshire community about issues relating to Israel and the Middle East”. The Jewish Federation of New Hampshire recently reinstated its Shlicha program, welcoming an Israeli woman to New Hampshire in 2017 to educate the community about Israel. Nevada exported $93,000,000 worth of goods to Israel in 2017. In 2016, Israel and Nevada signed a memorandum of understanding on water-use innovation, making it the first of its kind between a U.S. state and a Middle Eastern company. The University of Nevada has received research grants from U.S.-Israel binational foundations. Nebraska exported $31,000,000 worth of goods to Israel in 2017. In 1993, Governor Nelson signed a memorandum of understanding promoting trade and exchanges related to agriculture with Israel. Nebraska officials worked to re-open Israel to U.S. beef exports after a 2003 ban. Nebraska company WR Reserve now ships significant amounts of beef to Israel. Governor Pete Ricketts hosted Israeli Agriculture Minister Uri Ariel at the State Capitol earlier this year. They discussed opportunities to promote agro-tech cooperation between Israel and Nebraska. Montana exported $5,000,000 worth of goods to Israel in 2017. In 2010, Governor Schweitzer traveled to Israel on a trade mission to discuss expanding business and trade ties between Israel and Montana. Israeli company 4Cast announced earlier this year that it will open an office in Missoula that is expected to hire 100 employees. The company offers predictive analytics solutions. Missouri exported $44,000,000 worth of goods to Israel in 2017. 13 different Minnesota universities or research facilities have received grants from U.S.-Israel binational foundations. Kansas City and the Israeli city of Ramla are “sister cities”. In 2017, Governor Greitens signed a memorandum of understanding with Israeli company HackerUSA to work with Missouri colleges and universities on cyber security training programs. Mississippi exported $57,000,000 worth of goods to Israel in 2017. The University of Southern Mississippi has received research grants from U.S.-Israel binational foundations. The Mississippi state legislature passed a strong Iran sanctions bill in 2015, prohibiting the state from entering into contracts with any company that does more than $20 million worth of annual business with Iran’s oil and gas sector. Minnesota exported $99,000,000 worth of goods to Israel in 2017. 15 different Minnesota universities or research facilities have received grants from U.S.-Israel binational foundations. Since 1980, the America-Israel Chamber of Commerce of Minnesota has worked to develop strategic relationships and promote collaboration between Israeli and Minnesota companies. In 2017, the Minnesota state legislature passed legislation prohibiting state agencies from contracting companies involved in the BDS movement. In December 2016, Governor Charlie Baker traveled to Israel with 40 business leaders from Massachusetts where they met with over 400 Israeli leaders and business executives. During Governor Baker’s 2016 trip, he signed an MOU between the Massachusetts Technology Collaborative and Israel’s CyberSpark, an Israeli non-profit that facilitates the advancement of Israel’s cyber security industry. In 2017, over $200,000,000 in Massachusetts exports to Israel. Homestate of Safra Catz, CEO of Oracle. In 2015, Israeli-founded businesses in Massachusetts generated over $9 billion in revenue. A 2016 study found that Israeli-founded businesses generate over $18 billion in economic benefit to Massachusetts and that they directly employ more than 9,000 people. In 2011, Governor Deval Patrick signed an MOU with the Israeli Trade Minister and Chief Scientist to promote further R&D between Massachusetts and Israel. This MOU created the Massachusetts-Israel Innovation Partnership. Maine is home to Seeds of Peace, a camp that brings together Israeli and Palestinian youth in order to empower young people from conflict areas. Almost $10 million worth of Maine exports to Israel in 2017. In 1999, Maine Attorney General Andrew Ketterer organized a legal affairs mission to Israel. ComNav Engineering in Portland and System Logistics Corporation in Lewiston have both received significant Foreign Military Financing contracts for Israel. The Association of Israel’s Decorative Arts (AIDA) brought a group of ceramic artists to Watershed, Maine as part of a collaborative program. Louisiana exported $145,000,000 worth of goods to Israel in 2017. 5 different Louisiana universities or research facilities receive grants from U.S.-Israel binational foundations. Earlier this year, Governor Edwards signed an executive order prohibiting state agencies from contracting with companies involved in the BDS movement. Tulane University houses the U.S.-Israel Energy Research Innovation Center. Kentucky exported $85,000,000 worth of goods to Israel in 2017. 3 different Kentucky universities or research facilities receive grants from U.S.-Israel binational foundations. In 2016, the Kentucky House of Representatives passed a resolution condemning the BDS movement. Kansas exported $41,000,000 worth of goods to Israel in 2017. 3 different Kansas universities or research facilities receive grants from U.S.-Israel binational foundations. In 2017, the Kansas state legislature passed strong anti-BDS legislation that was signed by the governor. Governor Sam Brownback traveled to Israel in 2017. During the trip, he signed a memorandum of understanding with Israel’s energy minister encouraging cooperation in water technology, oil and gas exploration, smart electrical grids and expanding renewable energy. Idaho exported $10,000,000 worth of goods to Israel in 2017. The University of Idaho has received research grants from U.S.-Israel binational foundations. In 2008, the International Business Division in Idaho organized the Idaho-Israel business summit to promote economic ties between Idaho and Israel. December 2008: Governor Linda Lingle and Shai Agassi, CEO of Better Place, signed a Memorandum of Understanding centered on a plan to bring an electric-car network to Hawai‘i, thus creating a model for the adoption of electric cars in the U.S.
May 2004: Gov. Lingle signed a Memorandum of Understanding between the state of Hawaii and Israel to encourage cooperation concerning agriculture and aquaculture research and development. Gov. Zell Miller created GIE in 1992 to explore emerging technology in both industry and agriculture, enhance trade, encourage tourism and jointly participate in economic development programs. The GDED promotes trade, investment, and tourism in Israel through its office located in Jerusalem. American Israel Chamber of Commerce, Southeast Division: Based in Atlanta, the SE Division of AICC helps Israeli businesses explore new markets and develop business relationships with companies in Georgia as well as Alabama, Mississippi, North and South Carolina and Tennessee. March 2011: Orlando Mayor Buddy Dyer facilitated the signing of a Memorandum of Understanding for international collaboration and strategic relations between the Florida Hospital and Sheba Medical Center at Tel HaShomer. Among the many areas of collaboration are robotic surgical training, medical simulation, and stem cell transplant. December 1987: The Florida-Israel Cooperative Venture (FICV) was created to foster cooperation in areas of mutual benefit, including tourism, trade and investment and the advancement of technologies. In August 1989, an Agreement of Cooperation was signed by Gov. Bob Martinez to reinforce the FICV. Delaware Governor Jack Markell traveled to Israel on a four-day trip to meet with high tech business incubators, companies, and officials in 2013. In 2010, Delaware Secretary of State Jeff Bullock led a trade mission organized by the state’s Middle East Trade Office that represented Delaware’s business, legal and academic communities. The mission targeted business appointments for the Delaware participants with potential Israeli partners. ILC Dover in Frederica has received significant Israeli Foreign Military Financing contracts. Connecticut-Israel Exchange Commission was established in the late 1980s to promote scientific, educational, technological, commercial, and industrial and cultural cooperation between Connecticut and Israel. In 2005, an MOU was signed between Sikorsky Aircraft and the Government of Israel to develop the Armed Blackhawk helicopter for use by the Israeli Air Force. In April 2010, Rep. Joe Courtney led an economic mission to Israel that included businesspeople from at least 12 major Connecticut companies. More than 250 Connecticut companies have significant financial stakes in Israeli companies. In 2011, Connecticut investors created the Connecticut-Israel Technology Initiative. In 2017, a delegation of two dozen Israeli startup executives and government officials visited Connecticut with the goal of advancing the economic partnership between Israel and Connecticut. July 2010: Gov. Bill Ritter signed a Memorandum of Understanding with the Jacob Blaustein Institutes for Desert Research (BIDR) in Israel's Negev desert with the stated goal being to "encourage voluntary interaction and cooperation and to promote friendship between the two parties for their mutual benefit." July 2010: Department of Natural Resources and Agriculture signed a Memorandum of Understanding with the Desert Agro Research Center in Israel that is focused on water and agriculture research and development in arid and semi-arid climates. July 2010: Colorado School of Mines established workforce-development ties with the Israel Institute of Technology (Technion) to help develop the discovery of a vast natural gas reserve off Israel's coast. February 2016: Israel's Science and Technology Minister Ophir Akunis signed an agreement between Israel's Science and Technology Ministry and the California Institute for Regenerative Medicine. The agreement provides a framework for collaboration on stem-cell research, which will be jointly funded by both participants. July 2014: Governor Jerry Brown and Israeli Prime Minister Benjamin Netanyahu signed a agreement to cooperate on research and technology. Chief Scientist Avi Hasson called the deal another in a series of “votes of confidence in Israel’s economy, industry and innovation from a large number of US states and companies." This agreement would export Israeli desalination, water recovery and recycling, water filtration, and water security technology to water-needy the US state. March 2014: Governor Jerry Brown and Israeli Prime Minister Benjamin Netanyahu signed a pro-business agreement designed to strengthen economic and intellectual ties between the states. The pact covers issues such as cyber security, water conservation, education, agricultural technology, health and biotechnology. November 2009: Assemblyman Bob Blumenfield (D-San Fernando Valley) officially signed AB 1032 calling for an immediate Memorandum of Understanding between California and Israel o foster technology development, business development and educational opportunities in solar energy and the environmental technology industries. June 2008: Los Angeles Mayor Antonio Villaraigosa signed a Memorandum of Understanding with the International Institute for Counter-Terrorism (ICT) in Herziliyah, Israel to tighten cooperation and existing relations between ICT and the City of LA's homeland security apparatuses. The LAPD and the LA-World Airports would receive new training and education programs on counter terrorism. October 1999: Gov. Gray Davis visited Israel and signed a Memorandum of Understanding for cooperation in the area of biotechnology, bio-informatics and bio-agriculture so as to create an increased commercial and research linkages. May 1998: Gov. Wilson and Israeli Minister of Trade and Industry Natan Sharansky signed a Memorandum of Intent to encourage the growth of trade and investment relations with the prospect of expanding the growing economic cooperation between California and Israel. Since 1996, Arkansas exports to Israel have totaled more than $380 million. In 2017, the Arkansas legislature passed a law requiring all companies signing contracts with the state of Arkansas to pledge that they are not boycotting Israel. The University of Arkansas and the National Center for Toxicology Research have both received grants through U.S.-Israel binational foundations. In 2015, the University of Arkansas Dale Bumpers College of Agriculture, Food and Life Sciences hosted a meeting with Israel’s Binational Research and Development fund to discuss collaboration and grant opportunities. In October 2017, Ben-Gurion University of the Negev (BGU), the University of Arizona (UA) and the Universidad Nacional Autónoma de México (UNAM) launched a program to engage in joint research projects focusing on six technology sectors: arid lands agriculture and water; alternative energy; defense and cyber security; intelligent transportation systems; health care information technologies; and sustainable mining. Since 1996, Alaska exports to Israel have totaled more than $16 million. Alaska receives millions of dollars worth of foreign military contracts with Israel each year. Alaska companies that have received these contracts include General Dynamics in Cullman and Vector Hawk Aerospace in Daleville. Senator Lisa Murkowski authored the U.S.-Israel Energy Cooperation Enhancement Act that passed the Senate in 2014. Israel is the state of Alabama’s 9th leading trade partner. In 1997, Governor Fob James traveled to Israel and signed a memorandum of intent to improve trade relations and encourage technology transfers between Alabama and Israel. Alabama receives millions of dollars worth of foreign military contracts with Israel. Alabama companies that have received these contracts include Vector Hawk Aerospace, Boeing, and Lockheed Martin. McDonnell Douglas of Huntsville shared a $5.3 million grant with 3 Israeli companies for a joint project to develop solar power stations to produce electricity at competitive prices. In 2016, the Alabama state legislature passed a strong anti-BDS that was signed by the governor. Washington exported $435,000,000 worth of goods to Israel in 2017. 10 different Washington universities or research facilities have received grants from U.S.-Israel binational foundations. The Washington-Israel Business Council works to promote economic cooperation between Washington and Israel. The Boeing Corporation partnered with Israel to create the Arrow missile-defense system. 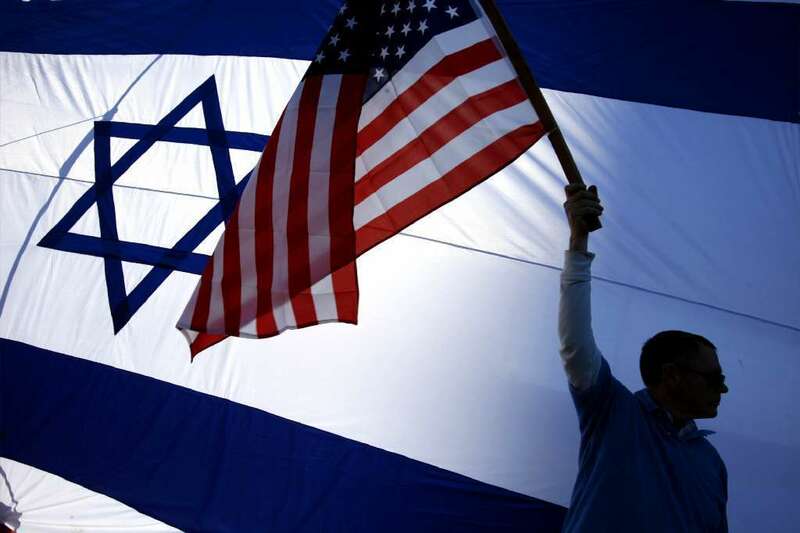 America and Israel share a special bond. Our relations are unique among all nations. Like America, Israel is a strong democracy, as a symbol of freedom, and an oasis of liberty, a home to the oppressed and persecuted. Let us make it clear that we will never turn our backs on our steadfast friends in Israel, whose adherence to the democratic way must be admired by all friends of freedom.